The Vince Pettinelli Orchestra is a high energy 18pc. band that plays classic and modern big band favorites with a mix of R&B and pop for audiences throughout NJ and PA. 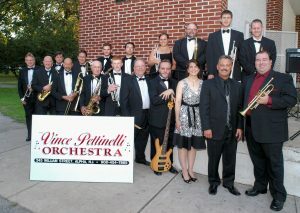 The Vince Pettinelli Orchestra is an energetic swing band that has entertained large audiences throughout the region for the past 40 years. With a great horn section, tight rhythms, and top quality vocalists, the VPO is comprised of the finest musicians in the area. 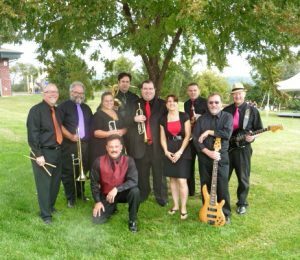 Performing a variety of musical styles from big band to classic pop hits, we are available for private and public functions. We are a crowd favorite at outdoor venues and festivals, with a diverse song list from Glenn Miller to Michael Buble. We play the music you want to hear. We hope you have a dance area ready, because our crowd will get up and dance. One of our greatest testimonials! My husband and I are both trained musicians and music teachers. Neither of us are into what I would refer to as “club” style music. Not only that, many of our guests were older than us (we’re in our late 20s) and also don’t get into the kind of music you hear on pop radio. Vince’s band is a fantastic mix of many styles of music – R&B, funk, swing, 60s, and 70s – ALL music that is really great for everyone (no matter the age!) to dance to. They are very professional and talented musicians! There’s a 10 piece wedding band and an 18 piece swing band (if you wanted to go all out and had room for them). We used the 10 piece band and the sound was great. These guys (and gals) come highly recommended! Check out our media page for video and more photos from the VPO. If you would like the 10pc or 18 pc band to play at your event, please contact Vince Pettinelli for details.